How can I protect my computer against a lightning storm? My computer is not running as fast as it used to, what can I do to correct this? What is the proper procedure for rebooting my internet equipment? I want to use multiple computers or other internet devices (video game systems, internet phone) on my internet connection, how do I do this? My internet is running very slow, what can I do to correct this? I am going to be away from home, can I still have access to the internet/email while away from home? I need a walk through for setting up Outlook Express or Windows Mail (Vista) with my email account. 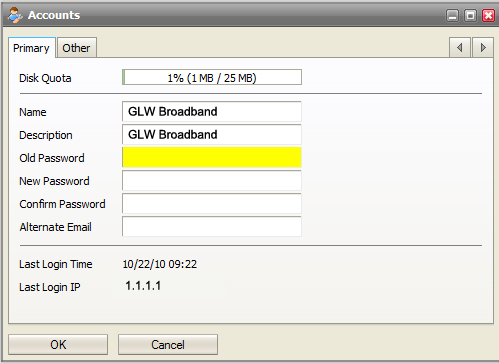 I want to use GLW Broadband for email, how do I get an email address? How many email accounts are provided with a residential account? How do I log on to your webmail service? I am going to be away from home, is there a way to check my email while away? I want to ensure/prevent email delivery from certain individuals/email addresses. How do I delete an Email that I received? I may have a virus, where can I download a tool to check for and remove the virus? I may have spyware on my computer, where can I find software to eliminate these types of threats? How do I check my voice mail from my home phone? How to check my voice mail from a different location? How can I change my voice mail greeting? How can I forward calls to another phone? 1. How can I protect my computer against a lightning storm? » Install a surge protector between the power socket and the computer's power cable, and spend the extra $20 to $30 to get an actual surge protector, not just a power strip. » Get surge protectors that offer protection from surges through network cables. » Check protection devices regularly. At least once a year you should inspect your power protection devices to make sure that they are functioning properly. » Use dedicated circuits, if possible, putting the computer on its own power circuit, so it isn't sharing the power with other electronic devices. » Turn off and disconnect the power cord during an electrical storm. » Turn off power during a blackout. If you lose power, when the power comes back on the signal can initially be inconsistent, which can make things more difficult for your power supply. 2. My computer is not running as fast as it used to, what can I do to correct this? If you are not running anti-virus and anti-spyware software or are not up to date on your anti-virus or anti-spyware definitions, we would recommend you update those products or install new copies of them and do a full system scan. More often than not, internet congestion is usually the fault of a virus or spyware software being resident on the computer. Check our downloads page for free anti-virus and anti-spyware solutions. You may also want to uninstall software you are no longer using. Depending on the computer's age you may want to think about upgrading as well. 1. What is the proper procedure for rebooting my internet equipment? Warning: Failure to restart your equipment in the correct order could prevent you from accessing the internet. 2. I want to use multiple computers or other internet devices (video game systems, internet phone) on my internet connection, how do I do this? You would need a product called a "Router." This is sold in most popular electronic stores as well as through GLW Broadband directly. You can call our offices for our current prices. A router gives you the ability to hook up multiple devices (usually 4) to a single cable modem. Wireless routers are also available. These allow multiple wireless devices to also use your internet connection. Typically the wireless routers also have wired plugs on them as well. 3. My internet is running very slow, what can I do to correct this? If you are running "Peer to Peer" (aka P2P) applications you may want to try disabling them. Typically these programs will send data out when you are not using them causing your internet to perform poorly. If this does not solve your problem, please call our office at (440) 926-3230. 4. I am going to be away from home, can I still have access to the internet/email while away from home? We only offer internet service locally through cable, however, you can still check your email while away using another internet connection with our webmail service. 1. I need a walk through for setting up Outlook Express or Windows Mail (Vista) with my email account. To set up an account using Outlook Express, please click here. To set up an account using Windows Mail (Vista) please click here. 2. I want to use GLW Broadband for email, how do I get an email address? You must first call us and provide the desired username and password. Please call us at (440) 926-3230 to have an email account setup. 3. How many email accounts are provided with a residential account? We currently provide 3 email accounts with all residential subscribers. Additional accounts are available for $1/ea a month. 4. How do I log on to your webmail service? At the top right of this site is a link called "Webmail." You can either click that link or use this one (http://webmail.glwb.net). Your 'User name' is the portion of your email address that is before the @ sign. (i.e. for jsmith@glwb.net you would use 'jsmith' as the username). Your password is your normal email password. 5. I am going to be away from home, is there a way to check my email while away? 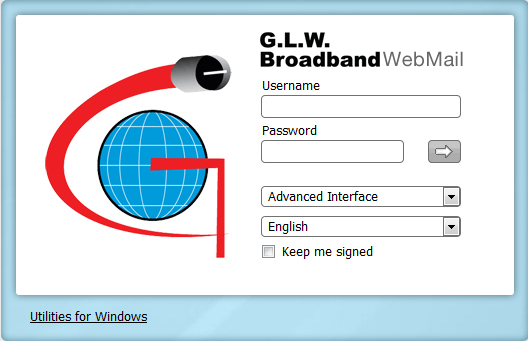 As long as you are on a computer that has internet access you can use our webmail service. 6. I cannot send or receive email. 1) If you are receiving an error message similar to "Socket error: 10061, Error Number: 0x800ccc0e" when using Outlook or Outlook Express this is due to you having some sort of "Internet Security" or "Firewall" software installed on your machine. Disabling this software should solve your problem. 2) Your internet might be out. Make sure you can browse a website. If you cannot, you are having a general internet outage. Please call our office for support (440) 926-3230. 7. How can I change my email password? Call our office at (440) 926-3230 Mon-Fri 8am-5pm and we can change it over the phone. Use our Webmail service. If you do not know how to log into our Webmail service, there is a FAQ for that above. 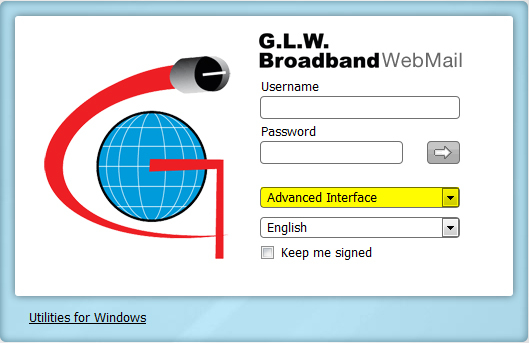 When at the login screen, make sure it is set to Advance Interface highlighted below. Do not CLICK Tools but instead hover your mouse over the Tools. A menu will drop down and there will be Accounts. See image below. Now to change your current password to a new password, you first have to re-type your old password in the Old Password box. See Image Below Highlighted in Yellow. Once the old password has been typed in, simply type in the new password that is going to be used in the next two boxes labeled New Password, Confirm Password. Once the new passwords have been changed click the OK button. See image below highlighted below. 8. How do I add people to my contact list? *Please note that 'Contacts' in the Webmail is same as Address Book. 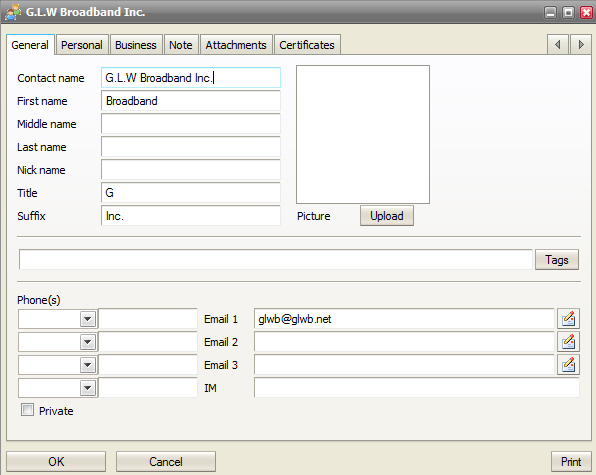 Also this will ensure email delivery from certain Individuals / email address. Click on the email so that it is highlighted. When 'Contact' is clicked a window will pop open. Fill out the blanks with the info about the contact if needed. When done press OK button save changes. 9. I want to ensure/prevent email delivery from certain individuals/email addresses. To ensure delivery please refer to "How to add people to your Contact List." Highlight the email you wish to block. 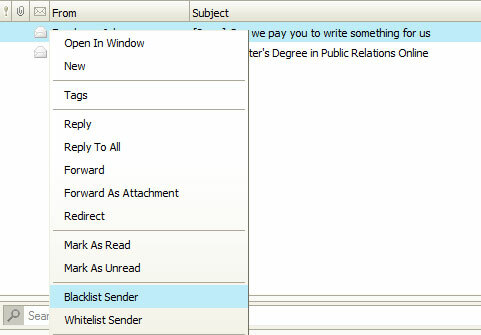 Right click on the email that is highlighted and scroll down to Blacklist Sender and click on it. Once Blacklist Sender has been clicked. A confirmation will open up. Click the OK button to confirm. Now that email is Blacklisted. 10. How do I delete an Email that I received? There are three ways of deleting an Email. 1: Click on the email that is no longer needed and make sure it is highlighted. Once the email has been clicked on, press the Delete key on your keyboard and the email will disappear and go into the trash folder. 2: Same steps mention above but instead of pressing the Delete key on the keyboard. Right click in the email and there will be a Delete in the menu. Click on the Delete and the email will be deleted. 3: Another way of deleting an email for advanced user will be to simply click on the email and drag the email to the trash folder. Emails in the trash folder do count towards your email space storage. 2. I may have a virus, where can I download a tool to check for and remove the virus? Please visit our downloads page for free anti-virus software for your PC. Any software that covertly gathers user information through the user's Internet connection without his or her knowledge, usually for advertising purposes. Spyware applications are typically bundled as a hidden component of freeware or shareware programs that can be downloaded from the Internet. Once installed, the spyware monitors user activity on the Internet and transmits that information in the background to someone else. Spyware can also gather information about e-mail addresses and even passwords and credit card numbers. Also called adware or malware. 2. I may have spyware on my computer, where can I find software to eliminate these types of threats? Visit our downloads page for free anti-spyware software for your PC. 1. How do I check my voice mail from my home phone? 2. How to check my voice mail from a different location? 1. From any phone, dial the number of the subscriber with Voice Mail. 2. 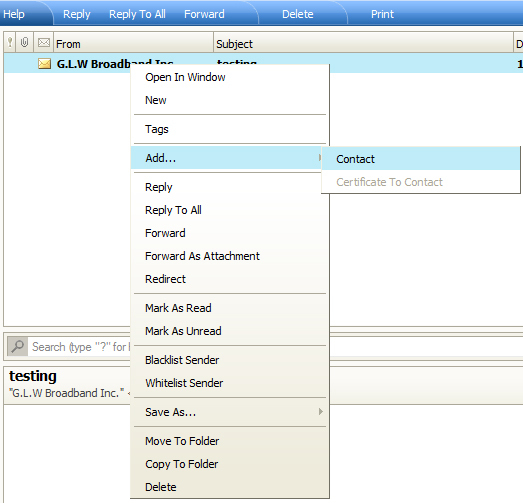 When the greeting message is playing, dial the star key (*) to interrupt the message and access your Voice Mail options. 3. When prompted, enter your Password and press the # key. 3. How can I change my voice mail greeting? 4. How can I change my voice mail password? 5. How can I forward calls to another phone? From your VoIP phone line dial *72 followed by the number you would like to calls to be forwarded to.